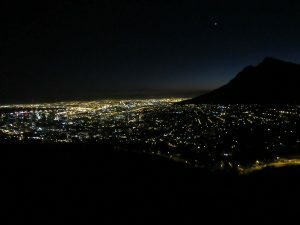 The GLCM squad got an early start today for their last full day in Cape Town, rolling out of the Westin Hotel at 4:30 am for a brisk, early morning hike. 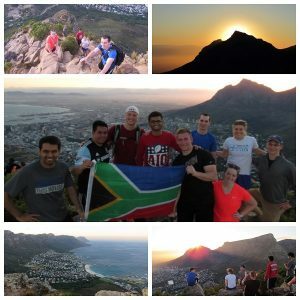 The team set out to conquer Lion’s Head Mountain, a 4.5 mile round trip hike, and take in the awesome sunrise 2,195 more feet atop this beautiful city. After 45 minutes of climbing along rugged trails, we found ourselves looking out upon some of the most breath taking views we’ll ever see in our lifetimes. The group was weary and our muscles screamed, but not so much as to render us unable to muster up several hundred selfies, videos, new profile pictures, flawless renditions of Shakira’s Waka Waka, and definitely more than a few smiles. 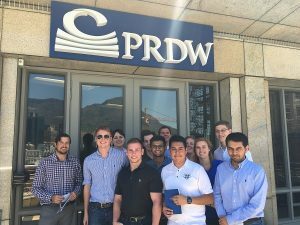 After returning back to the hotel and eating breakfast, the GLCM crew set out to continue our South African construction education at PRDW’s South African headquarters in Cape Town where we were met by our gracious host: Engineer Ryan Abrey. PRDW is a firm of consulting port and coastal engineers that specializes in conducting feasibility studies and carrying out designs for structures along ports and coastal regions. 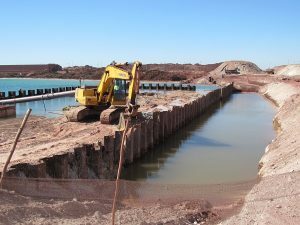 This includes performing site investigations; simulations; building models; and devising systems for dredging, land reclamation, sea walls, and breakwaters. Ryan informed us of the incredible precision, accuracy, and foresight required for these systems. PRDW undertook one project that utilized 7-ton Core-Loc units and 30-ton Block Well units that needed to be placed underwater ever so carefully, with several divers conducting surveying and placement of the interlocking units underwater, so the system would distribute the energy and flow from waves as intended. 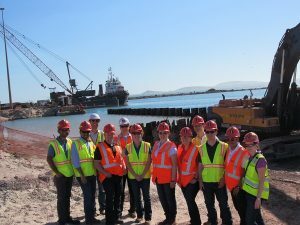 This particular project involved constructing a breakwater that was 100 feet deep in places, spanned nearly 2 miles, and has a design life of 100 years. The entire project costs hundreds of millions of US dollars and took 8 years to design and construct. Needless to say, as a group from the University of Illinois, over 600 miles from the nearest ocean, these projects were absolutely mind-boggling to us. Ryan went on to share with us his personal experiences as an engineer working on project sites throughout Africa, including his work at the Konkola North Copper Mine in Zambia. It was nothing short of fantastic to discuss with Ryan the similarities and differences in construction management practices between the United States and Africa. After thanking Ryan for his hospitality, we proceeded to trek up the western coast of Africa to Saldanha Bay to visit PRDW’s General Maintenance Quay Upgrade job-site. 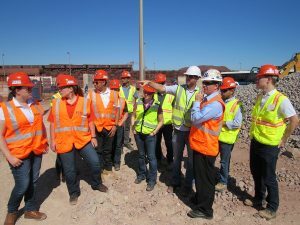 The GLCM crew was granted access to tour the job-site after completing extensive safety and security protocols that included receiving access permits, camera permits, passing a Breathalyzer test, and finishing a safety orientation. 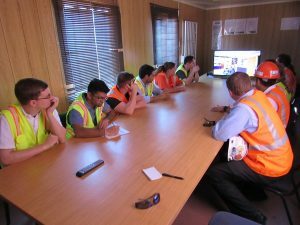 We were then introduced to the Resident Engineer for PRDW on site: Leon, who gave us background on the project and showed us around the site. 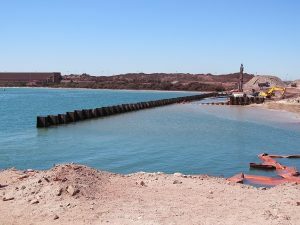 The project involves building a quay wall for the Transnet National Ports Authority (TNPA) that will allow larger tankers, transporting greater amounts of material, to dock in the Port of Saldanha Bay. PRDW is acting as the consultant to TNPA for this project, and the general contractor on site is Basil Read. Leon shared with us some of the challenges on this project and walked us through the process of building this quay wall. First they embed large piles 16 feet into the seafloor, and as deep as 52 feet from sea level, to create the quay wall. Then the construction team sets concrete blocks underground, behind the current embankment, and connects the blocks to the quay wall via thick tie rods. Finally soil is loaded into the ocean, displacing the water and creating the new embankment. This project currently has approximately 150 workers on site, and is slated to be completed on May 11 of this year, with nearly $7,000 in penalties for every day the project is late. Upon returning to Cape Town, the GLCM crew ventured to a delicious pizzeria called ColíCacchio for dinner, and savored their final full day in the city. Johannesburg certainly has a tough act to follow, but we’re incredibly excited to continue onto the final leg of our South African adventure. Thank you to PRDW for hosting us today, as well as everyone else who’s helped make our stay in Cape Town so great over the past week, and a special thank you to our jack of all trades tour guide/driver Brian Cookson for helping us receive a true Cape Town experience. Johannesburg here we come!